. :: Chefs de Mission Meeting Brings Together Top National Federations from Around the World in Preparation for the FEI World Equestrian Games Tryon 2018 ::. Tryon, NC - May 8, 2017 - In preparation for the FEI World Equestrian GamesTM Tryon 2018 (FEI WEG), Tryon International Equestrian Center (TIEC) held the first Chefs de Mission meeting from Monday, April 30, through Wednesday, May 3, welcoming organizational leaders of national equestrian federations from around the world to the venue, as preparations for the Games continue. Leaders from fifteen National Federations attended the meeting to discuss event logistics, travel, hospitality, lodging, and sport with the event's Organizing Committee, comprised of both the TIEC leadership and key members of the Fédération Equestre Internationale (FEI). "It is such an honor to host the FEI World Equestrian GamesTM Tryon 2018 here at this facility and this week really brought it home as we had our first official meeting of the Chefs de Mission on-site," said Sharon Decker, Chief Operating Officer and member of the Organizing Committee. "We have a lot of work to do over the course of the next eighteen months and an amazing team to do it. We are incredibly excited for this opportunity and we are pleased with what we accomplished this week." "The meeting was a great success and the response from both the Chefs and the FEI Discipline Directors was very positive. We have a lot of work to do, but I am confident that with such great support, we will deliver the best Games yet," added Michael Stone, President of the Organizing Committee. Representatives were delighted with their introductory experience at TIEC and commented on the vastness and convenience the facility offers to athletes, officials, and spectators. "This is a great venue. It's very big and it's something that we don't see often. Everything can be put in one single location," said Wendy Laeremans representing Belgium. "The plans are that all of the disciplines will be in the same location and for us, as a federation, it's very good. It makes the logistics much simpler for us and our athletes." Members of the National Federations for participating nations arrived at the venue on Monday and spent their two-and-a-half day stay discussing imperative details surrounding the success of the event, which will span two weeks in September 2018, beginning Tuesday, September 11, and continuing through Sunday, September 23. "It's a puzzle that we're just beginning to fill in the pieces together," said Evelyn Niklaus representing Switzerland. "It's the FEI, the other National Federation leaders and the Organizing Committee who help to provide the information to us so that we can begin making decisions and reviewing our budgets, which is very important. This was a very informative week and we're excited to begin this process." Federation members were given the opportunity to ask detailed questions regarding the process of equine importation and exportation, travel, lodging, and competition logistics. 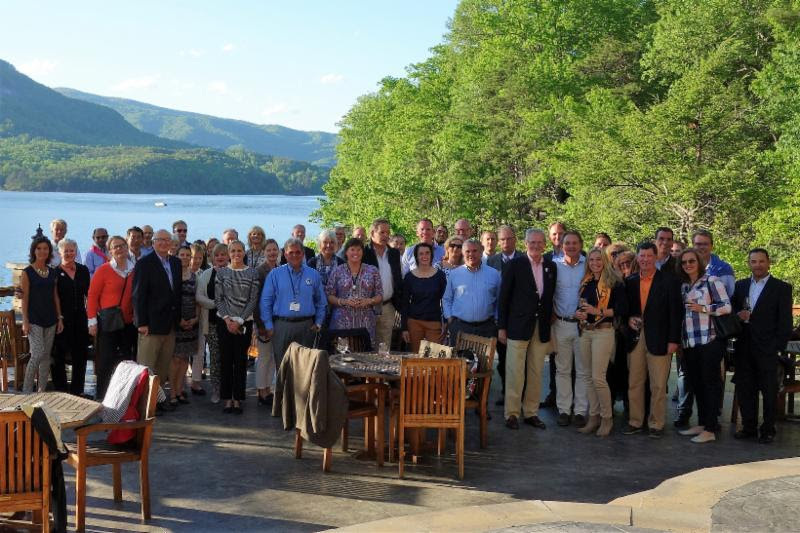 They also spent time experiencing and exploring the amenities of Tryon Resort, as well as the Blue Ridge Mountains region, which will welcome more than 500,000 spectators throughout the duration of the two-week event in 2018. "There is a challenge with this event, both as an organizer and for our riders, because they typically travel as equestrian businessmen and women with several horses during the year. Then, when they come to championships, they have a week with only one horse. They get bored quite easily and we have to keep them happy, occupied, and busy," said Andre Shopmann of Germany. "This location has so many great activities, like the clay shooting and golfing, that it will be a very fun experience for our teams, riders, and staff."